During the winter months I study all the House Finches that come in to my bird feeders a little closer. That is because in winter there is a good chance that it may actually be a Purple Finch. You see they migrate to the eastern parts and central parts of the United States this time of year. The rest of the time they spend up north for breeding. The two species are so similar that it is easy to confuse a House Finch for a Purple Finch if you don’t know the difference. And…then you still could confuse them even if you do know the difference. Here’s the problem, there are so many color variations in both species that it can be challenging to determine which is which. 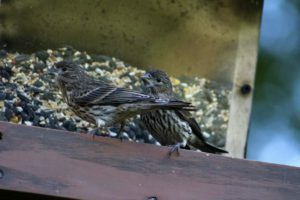 So how do you know if it is a House Finch or Purple Finch and how do you tell the difference? The House Finch ranges between 4.9 and 5.9 inches in length. The male has a red to orange-red head and breast, brown cheeks, and brown streaks on its belly, tail, and wings. Females do not have any red at all and are brown with streaked underparts, tail, and wings. Both the male and the female have long flat heads. House Finches are found widespread throughout the United States which includes Hawaii, with most being permanent residents.. Some do migrate more south during the winter months. They have adapted well to being around humans and you can see them pretty much everywhere in the city, in the suburbs, towns, and on farms. They have no problem coming in to backyard feeders especially if there is sunflower seed, their favorite. We also get them at our thistle/nyger feeder as well. During the summer months you may also see them at your hummingbird feeders as they like the sugary nectar. House Finches will also feed on berries, the buds on flowers, and small aphids usually during the summer months. Interesting Fact: The House Finch is native to the western part of the United States and Mexico. 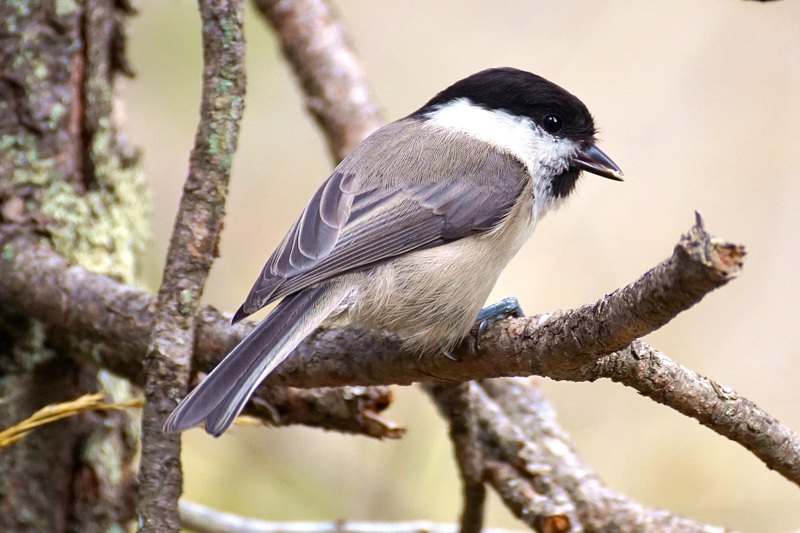 In 1940, a small number of birds were released in the state of New York. It was a failed attempt to use them as caged birds. The birds quickly started breeding and then spread throughout the United States. Purple Finches range in size from 4.7 to 6.3 inches which is pretty close to the House Finch. However, Purple Finches are more stocky than the House Finch. The problem here is that you actually have to have them perched next to each other to tell the difference. Purple Finch males have a deep reddish raspberry coloring on their head, chest, and back with the redness spread on parts of their wings. They have a lighter red or rose stripes by the eyes and their cheeks are more of a darker brownish red. The wings and tail mostly have brown coloring. Females are brown and white with streaks on their underparts and white stripes by the eyes. 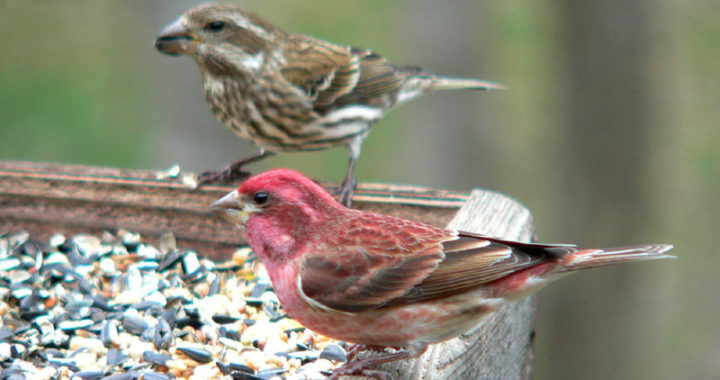 Purple Finches breed from North to Eastern Canada and the northeastern United States. You will find these birds in evergreen forests mostly but also mixed forests too. As mentioned earlier, this finch migrates to the central and eastern half of the United States during the cold winter months. During the summer months Purple Finches feed on seeds, berries, and small fruits as well as insects such as caterpillars and beetles. 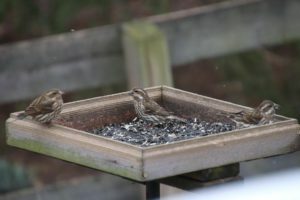 During the winter, they will come in to feeders if you stock them with seeds. Just like the House Finch this bird will also come to thistle/nyger feeders too. Can you tell the difference? Which one is which? 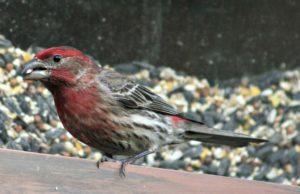 Look closer the next time you think you see a House Finch at your feeder. During the winter months Purple Finches migrate to the central and eastern half of the United States and will visit feeders that have seed. We get them at our thistle/nyger feeders too. You just never know when they will make an appearance and that is the beauty of winter bird watching, it is always a pleasant surprise when new birds show up. Purple Finches may stop in at any time maybe to visit one time or stay all day or week. You just never know and you definitely do not want to miss them. Do you have any thoughts or input that you would like to share about this post. Please feel free to make your comments below. Posted in Backyard Birds, Bird Feeders, Songbirds and tagged house finch, purple finch. ← What is a Kestrel?